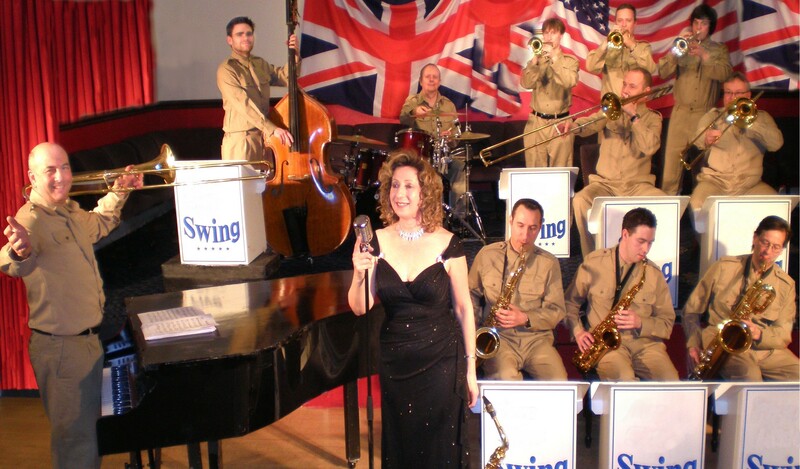 Five Star Swing are an exciting swing band specialising in swing and big band music. With sounds from the 1940’s to the Blues Brothers, Glenn Miller and everything in between. As well as our stage shows we also under take private and corporate bookings so if you have an event on the horizon and would like something unique why not talk to Chris our band manager and let him tell you how Five Star Swing can give your event the five star treatment. See the Band in Action! Why Book Five Star Swing? Theme/ Motown & Blues Brothers/ Great Gatsby / James Last / Trad’ Jazz / Christmas Swing Show. Five Star Accountability Insured & certificated – P.L I, P.A.T, Risk Assessment, Method Statement. Your event’s etiquette assured by Chris Smith’s oversight of seasoned professional musicians. Five Star Prestige Past clients include TV, Radio, West-End Hotels, Warners Holidays, Private Members Clubs, UK Theatres, Pop Stars, Politicians and Royalty. Five Star Additions Stage decoration including giant British & US flags, Stage Bunting, vintage “box-style” music stands, sound amplification and stage lighting plus interval recorded music. Everyone absolutely enjoyed the band. Every conference needs a wow factor and your band was it!